My latest invention: Peach dressing. I love to come up with dressings that bring a salad out in a new and interesting way. Well, it is peach season! What is more obvious than adding half a peach to the dressing in my blender? The dressing is wonderfully orange, a bit sweet from the peach, a little spicy from the garlic and has a creamy consistency. All in all, this is a great, fresh summer salad. You can use any kinds of greens you have in your garden, (or at your local farmer’s market or grocery store…) Arugula would be good as well, or spinach or any kind of lettuce. Just make sure you slice the fennel thinly. The garden greens are delicate in nature and if the fennel is too chunky they get buried but it. The dressing will be enough to be used for other salads. Just put it in a jar and store in the refrigerator. If you make on Sunday, you will have your dressing for the whole week! Combine all the ingredients in a blender and blend. 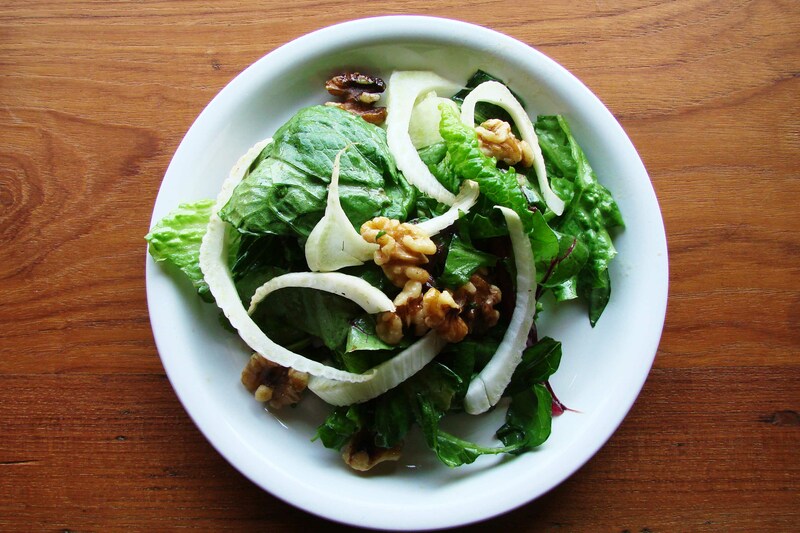 Arrange the different greens on a platter or in a bowl, put the fennel slices and walnuts on top and drizzle the dressing over the salad. Combine with freshly grilled vegetables and or a slice of grilled fish and you will be good to go! 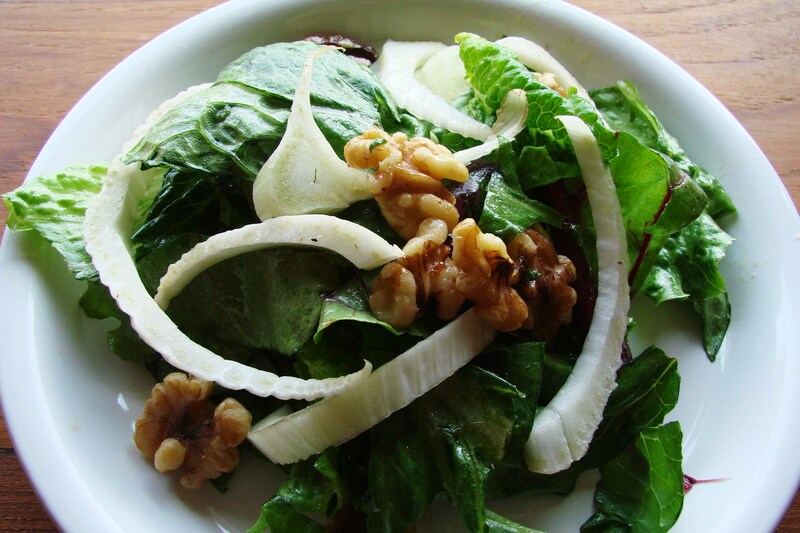 This entry was posted in Dancing Cook Reports and tagged beet greens, dressings, fennel, glutenfree, healhty eating, healthy lifestyle, Kale, peach, salads, sorrel, summer dishes, summer food, summer salads, vegan cooking, vegetarian cooking, walnuts by tikaaltemoeller. Bookmark the permalink. This dressing is so good and so unexpected. While I was eating it, I was like, what is this? It’s so good, but I can’t tell what’s in it. Thanks for sharing your secret Tika!